» home » magazine » 2009 » august 2009 » wind and solar energy where are the opportunities for metalformers? 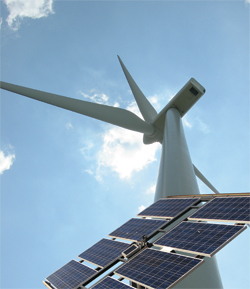 Wind and Solar Energy Where are the Opportunities for Metalformers? Shepherd Advisors was formed in 2000 to help private-company clients increase sales, margins and market share in clean-technology industries. Its team helps companies enter the clean-tech markets; find partners to increase access to distribution, manufacturing and suppliers; and to locate funding for research and development. We recently asked Shepherd Advisors’ president Loch McCabe to share his views on the opportunities that metalformers —particularly those with close ties to the automotive industry—have to link into the supply chain for the wind-energy and concentrated-solar-power industries. MF: We know that the recession, particularly the drying up of credit, has hit the alternative-energy industry pretty hard. Is the alternative-energy industry still an attractive target? McCabe: It’s true that some large projects have been put on hold, but growth of the alternative-energy space has been and will continue to be very strong. In the wind and solar industries, leaders predict that 2010 will be a record year. Increasingly favorable federal policies, a wealth of new incentives, and volatile, rising energy costs make most watchers of this industry quite bullish. MF: What are some of the emerging alternative-energy products and segments that auto-parts manufacturers/metalforming companies should be looking at? McCabe: As oil prices reach $70-plus per barrel again, the drive to improve vehicle fuel efficiency only gets stronger. Drive-train electrification and further light-weighting will continue to gather steam. We expect to see a growing innovation premium for products and processes that achieve weight reductions without sacrificing performance. Energy efficiency in industrial applications means more energy-efficient pumps, compressors, waste-heat recovery equipment, and the like. Part of the beauty—and the challenge—of the energy-efficiency market is that it comprises a multitude of companies and products—energy-efficient materials, lighting, HVAC, controls, etc. MF: Discuss the growth of the large-wind industry. McCabe: Last year, more new turbines were installed in the Untied States and across the world than ever before. In 2008 alone, nearly 27,000 MW of new wind-turbine capacity was installed globally, of which more than 8500 MW were installed in the United States. Today, the world has nearly 121,000 MW of wind-turbine capacity, installed mostly in Europe, the United States, China and India. At the end of last year, the United States edged long-time leader Germany for the lead in total wind-energy capacity installed, with more than 25,000 MW. The global wind market last year grew to $48 billion, 28 percent growth over 2007, and the U.S. wind market expanded to $12 billion. Yet, the U.S. wind industry is poised for even more impressive growth over the next 20 years. The U.S. Department of Energy has set the goal of providing 20 percent of the country’s electrical-power needs by 2030 from wind power. To do this, more than 300,000 MW of capacity will be required, requiring a massive expansion of U.S. installations. The wires are already being strung, with $11 billion of new federal stimulus funding aimed at expanding the transmission grid into the Great Plains and elsewhere. To learn more, visit the website of the American Wind Energy Association at www.awea.org. MF: What challenges do metalformers and other suppliers face as they look to get into the large-wind industry? • Large part sizes—Wind turbines, quite simply, are big. Think of a locomotive on a tower 300 ft. high, driving power from spinning blades as wide as a 747 jetliner. The nacelle itself can weigh more than 100 tons, and the tower another 75 tons, and they are nearly all steel and other metal alloys. And, these assemblies must last in the field for 20 yr. or more. 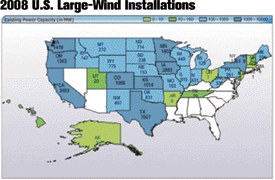 Map shows large-wind capacity (in MW) installed as of March 31, 2009. Source: American Wind Energy Association (AWEA). According to Matt Garran, director of technical services for the Great Lakes Wind Network (www.glwn.org), wind-turbine parts largely fall into two categories, those above 6000 lb. and those less than 600 lb. As Garran describes, main shafts in the nacelle can range from 4 to 20 tons, hubs can weigh 5 to 15 tons, and main frames can approach 30 ft. long. Not surprisingly, suppliers of these large parts typically also cast, forge, machine and fabricate heavy-duty large-scale parts for the construction and mining industries. • European roots. The wind industry is a global market led by Europeans. In 2007, roughly 80 percent of the large wind-turbine market was served by six OEMs: global leader Vestas (Denmark), GE Energy (U.S.), Gamesa (Spain), Enercon (Germany), Suzlon (India) and Siemens (Germany). The designs and standards are predominantly European, completed in the metric system. Even U.S. manufacturers GE Energy and Clipper Windpower use the metric system throughout their designs. European OEMs use European specifications for materials, parts and tolerance dimensions, coatings, couplings, and the like. Some OEMs have begun to consider using standard specs for U.S. production of noncritical parts, but they have a strong European bias. And, the OEMs already have well-established Tier One and Tier Two suppliers in Europe that provide exactly to spec. U.S. companies, particularly those not currently doing business in Europe with European companies, are disadvantaged. • Low-volume high-margin business model. While the parts can be large, volumes can be modest. Typical full-scale supply contracts will be in the hundreds per year. This often presents a challenge to auto-parts manufacturers, and often requires suppliers to change their priorities, business model and structure. • Rigorous quality, durability and delivery standards. Large wind turbines must operate under very challenging conditions for 20-plus years. Failures of bearings, gearboxes, control systems or hydraulics, for example, can take a turbine out of commission and be extremely costly to repair. Thus, quality control of parts and the manufacturing processes are of paramount importance to OEMs. 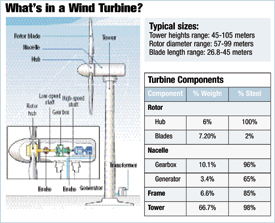 Major wind-turbine installations include the rotor, nacelle, frame, and tower, and their subsystems. Illustration courtesy of HowStuffWorks.com. OEMs also place a premium on absolutely reliable and on-time delivery. OEMs usually face stiff penalties from wind-project developers if they are late in delivering, installing and commissioning turbines. Thus, they impose strict delivery schedules on suppliers, and will pass penalties on to suppliers at fault. • Global competition. The large-wind industry is a well-established global industry, pitting U.S. manufacturers against veteran companies, many of which have been in the business for decades. OEMs are building U.S.-based supply chains to serve the large and growing U.S. market, yet U.S. firms go head-to-head with established suppliers that already have economies of scale. MF: What are some of the major metal-alloy components of a wind turbine, and how can U.S. metalformers leverage their resources to enter the supply chain? turbines also feature several subsystems, including fluid systems for cooling, lubrication and hydraulic power, yaw and blade-pitch systems and electronic control systems. Precise machining, turning, milling, welding, coating, drilling, boring, finishing and testing are usually needed to convert large castings into main components. To produce the large components, one must have tools that can accommodate their size and weight, and machine them with great precision. Also required are the cranes and other material-handling equipment to handle these large loads. The towers, of course, represent a major component, and are made of steel and/or concrete. Standard tower designs call for precisely rolled 2-in. plates, and use large flanges and bolts to connect tower sections. Interestingly, some lattice tower designs also are being used. Tower sections are long, large, and heavy, so OEMs also are looking at proximity to market and rail transportation to reduce costs. Tower sections are preassembled with ladders, elevators, wiring harnesses, etc. To withstand the force of the wind and long-term exposure to the environment, high-performance ductile iron grades are used for a majority of wind-turbine parts. Typically the alloys are modified for lower silicon and phosphorus levels. The AWEA metalworking factsheet (http://www.awea.org/_cs_upload/learnabout/publications/4146_1.pdf) offers additional relevant background. In addition to the large parts described here, large wind systems also comprise thousands of smaller parts that offer opportunities for contract machine shops, fabricators, fastener makers and integrators. One final comment: Though there is plenty of room for innovation in manufacturing design and processes in the large-wind industry, OEMs mostly are not interested, at least up front. Turbine designs must be certified to obtain insurance, and the testing process can run one to two years on a new turbine design. When it comes to innovation, OEMs are pretty risk-adverse, as are wind-project developers and financiers. MF: How can metalforming companies approach the wind industry to increase their chance of success? • Do your homework. The wind industry, like all of the emerging alternative-energy industries, has its own character, its own leaders, its own market drivers, its own business models and its own of doing things. It’s very worthwhile to invest the time to figure things out before you try to jump in. 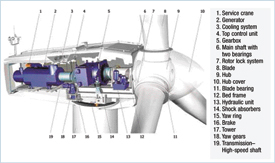 This cuta illustration from wind-turbine manufacturer Gamesa Corp. shows some of the major fabricated and machined components of a wind turbine. The AWEA website (www.awea.org) offers plenty of information about the market and the major OEMs. Attend conferences and network with others in the industry. Dig into the websites of major OEMs and Tier One suppliers to learn who the leaders are, what they want you to know about them and their products. Talk to companies already supplying the industry. AWEA provides access to a supplier database, and you also can get the annual Buyer’s Guide from North American WindPower (www.nawindpower.com) for a list of current and hopeful suppliers. • Take the long-term strategic view. Wind-turbine OEMs and their Tier One suppliers are in this industry for the long haul. It can take 12 to 18 months between initial discussions and receipt of an order. Then, if you’re successful, you’ll be asked to grow rapidly with the industry, requiring you to make repeated investments in equipment, facilities, people and capabilities. Think it through, make a plan, ask others to help you do it better, and make sure you have a good relationship with your banker. • Be a partner, not just a parts supplier. In large wind, and in other emerging alternative-energy industries, OEMs want to cultivate partnerships with their suppliers that will steadily improve product and reduce risk over the long term. Each OEM and Tier One in the industry is different, so you have to listen to what they are looking for, and give it to them. Building trust, especially through reliability, honesty, aggressive problem solving, and demonstrated willingness to invest and grow will go a long . • Get a quality referral. The OEMs in this industry are inundated with firms trying to get their business. A quality referral from someone trusted by the industry OEMs can save suppliers many months of effort. Two great sources of referrals are referral networks and suppliers/customers already in the wind-industry supply chain. Work with organizations like the Great Lakes Wind Network in Ohio, or NextEnergy (www.nextenergy.org) in Michigan, both of which provide supplier-screening services for OEMs. More and more states and even regions of states are setting up offices and staff to facilitate introductions. An even better source for many firms is their own supplier and customer network. Who do you know that is already supplying the wind industry? Are you already providing parts to GE, Siemens, Alstrom or other major players? • Think broadly about your opportunities. Most metalworking firms will never sell directly to a large wind-turbine OEM. On the turbine-manufacturing side of the business, Tier One and Two companies will likely be a better fit. The wind industry also needs construction equipment, cranes, supports, tractor trailers, rail cars, transformers, electrical substations, transmission poles and wiring, and maintenance and repair equipment and materials, and more. MF: What does the market look like for small wind, and how open is this market to new suppliers? McCabe: The small-wind market—turbines less than 100 kW in capacity—is beginning to experience serious growth, and so it offers tremendous potential. Turbines in the 10 to 50 kW range are being purchased by farms, schools, and other businesses; homeowners purchase turbines in the 1 to 2 kW range. There are four primary designs for concentrate solar power: parabolic troughs, linear Fresnel lens systems, power tower central receiver and solar dish. A number of features of the small-wind market are worth taking a close look at for many metalformers. In 2008, global small-wind sales exceeded $150 million, representing more than 50 percent growth over 2007. The United States represents about half of the worldwide market and is growing faster than the global market—78 percent in 2008. Unlike the large wind market, the major small-wind manufacturers are based in the United States, led by Bergy Windpower Co., in Norman, OK, and Southwest Windpower in Flagstaff, AZ. And, while the typical horizontal rotor-blade design is the dominant design, there are a wide variety of competing “egg-beater” and other designs that lend themselves to a variety of manufacturing processes. The volume potential for small wind is impressive. In 2008, 10,500 small wind turbines were sold in the United States, and 19,000 globally, and OEMs are gearing up for tens of thousands more. The market is very open to new suppliers. Not only are there literally dozens of new OEMs and a range of innovative and varying designs, but there also is a strong precedent for OEMs to turn to automotive suppliers for their manufacturing capacity. In Michigan for example, Mariah Power has formed a joint venture with automotive supplier MasTech to produce the Mariah wind blade at its recently retooled manufacturing facility in Manistee, MI. Also in Michigan, Cascade Engineering in Grand Rapids secured the North American sales and manufacturing rights of the rooftop-mounted Swift wind turbine from its UK developer, and is ramping up sales and production. 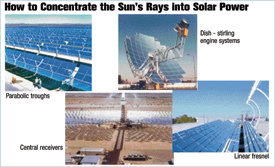 MF: In addition to wind energy, concentrated solar energy is getting a lot of press. Explain that technology and characterize its growth, please. McCabe: Concentrated solar power (CSP) is a rapidly emerging form of utility-scale solar power that offers numerous opportunities for metalforming companies. CSP produces electricity by using mirrors or lenses to concentrate the sun’s energy and generate heat. There are four primary designs for CSP: parabolic troughs, linear Fresnel lens systems, power towers and solar dish. More recently, thermal energy-storage technology has advanced to where such systems can effectively supply the grid 24/7, even when the sun fails to shine. This makes CSP projects even more attractive to utilities. Demand for CSP projects is taking off in the United States and in Europe. For example, more than 6000 MW of CSP projects are under development in the Southwestern United States alone, and that’s just the start. The U.S. market is expected to quadruple its current installed capacity by 2011. Due to the large size of the components, local sourcing often is preferred. Federal legislation and research spending in CSP both point to strong growth for the industry, and hence demand for manufactured components. What specific opportunities are out there for the metalforming industry? CSP plants feature several mechanical parts and processed metallic components. For instance, most heliostats (reflectors) are polished, curved/rolled sheetmetal sections; they comprise half of a solar tower plant’s capital costs. Trough systems also comprise polished sheetmetal sections, rolled into parabolic shapes. Drives and tracking systems also are used, to ensure maximum concentration of solar rays. And heat exchangers, steam turbines and engines capture the heat, leading to electricity generation. Other large components include tanks, water- and fluid-circulation systems and motors to adjust the mirrors.